In this release, we We have enhanced Co-browsing by allowing you to initiate it via chat. Agents and customers can request and/or allow co-browsing sessions via chat. For information on how to enable Co-browsing, refer to the main help on Co-browsing. To enable co-browsing for a chat session, administrator must enable this feature in Configuration Manager . 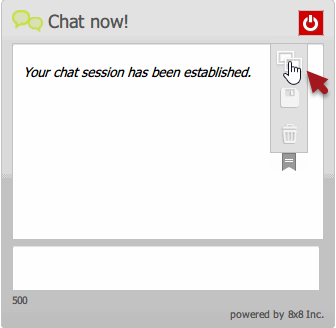 Open an existing Chat window. 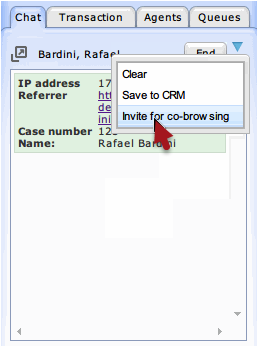 Select Offer the co-browsing request into the Chat window. Notice that the Start co-browsing session appears in the Chat window. 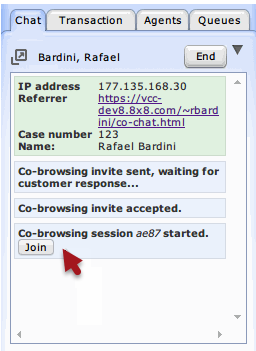 When this feature is enabled, both customers and agents can invite the other party to co-browsing during a chat session. Once the administrator enables co-browsing for chat, agents can invite customers for co-browsing during a chat session in Agent Console. Accept the incoming chat interaction. Open the chat interaction menu and select Invite for co-browsing. The customer is prompted to accept the invitation for co-browsing and clicks Yes, Start Sharing. The agent is notified when the customer accepts the invite. Click Stop co-browsing when the session ends. 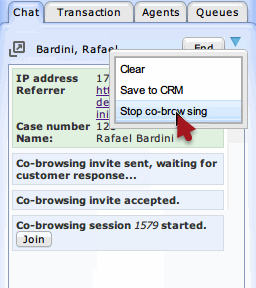 The customer can start or stop a co-browsing session by clicking in the Chat window.